The last few posts I’ve written about have revolved around vRealize Network Insight. In these posts I mention using the consoleuser account and in my case using the default password for this account, which for the record is ark1nc0ns0l3 (shhh, don’t tell anyone). Clearly not good practice so I thought I would briefly mention the process to change the password for the account. The steps involved to change the password are fairly straight forward and as the consoleuser account can be logged in via SSH out of the box it’s recommended to be changed. The below process are applicable to both the Platform and Proxy appliances. 3. Type in a new password, hit enter, and verify that password. As I mentioned above this account can be used with SSH and is enabled out of the box so recommended to be changed once vRNI is deployed. Well, we’re up to vRealize Network Insight 3.7 and still no GUI way of setting an internet proxy. Usually you would configure an HTTP Internet proxy via the VAMI but that also doesn’t exist for reasons I don’t quite understand??? Never the less the process to configure an HTTP Internet proxy can be performed via the CLI easy enough. Reasons why we might want to do this, apart from the obvious of gaining internet access where none exist without a proxy, is so we can check for software updates and connect to support. You will see something similar to below. 3. Next we set our HTTP proxy using set-web-proxy enable. This will stop and start a few services but not cause any disruption the to running of vRNI. Below is an example with a proxy address and port. 4. We run set-web-proxy show again. A bunch of network information will be returned along with connectivity status of a few URLs. Over in the settings page of vRNI you should now see some green icons indicating Upgrade Server Reachable. Earlier this week VMware release the latest update to vRealize Network Insight, version 3.7. If you jumped on this new update as I did you might have been caught out by a bad build (3.7.0.1518427076). 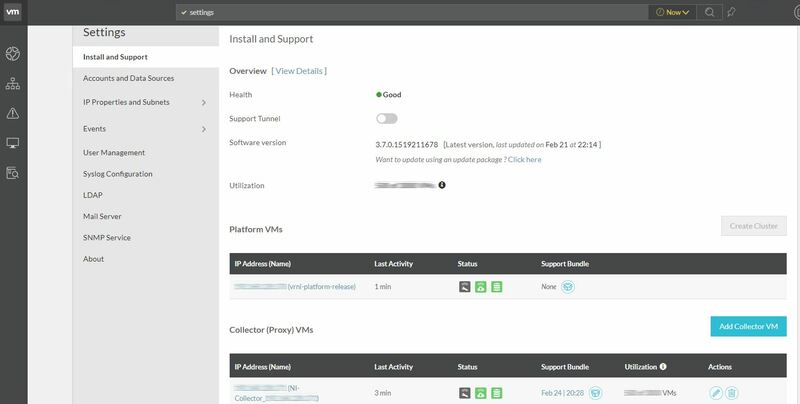 Upgrading to this version had a DNS issue that caused a communication issue between the Platform appliance and the Proxy appliance. The version was quickly pulled and replaced a day later with a new and working build, 3.7.0.1519211678. It’s unlikely that you will have this old build but before upgrading it’s best to check. vRNI can be updated in two ways. An Online upgrade via the GUI and an Offline upgrade via the CLI. There are a few reasons why you might want to perform an Offline upgrade. Cluster upgrades can only be performed via an Offline upgrade. Your vRNI appliance might not have internet access. Or like me you have configured a proxy server on your vRNI appliances but because vRNI wants to make your life difficult it doesn’t detect new updates. The Offline upgrade can only be performed on version 3.5 or 3.6 and is very similar to previous upgrades. 1. 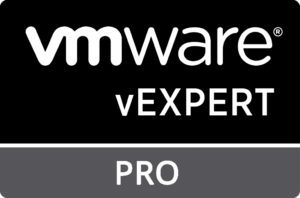 Download the ZIP bundle from VMware. 2. Snapshot both your Platform and Proxy appliances or live life like a cowboy. 3. Copy (SCP) the ZIP bundle to both appliances (Platform & Proxy). 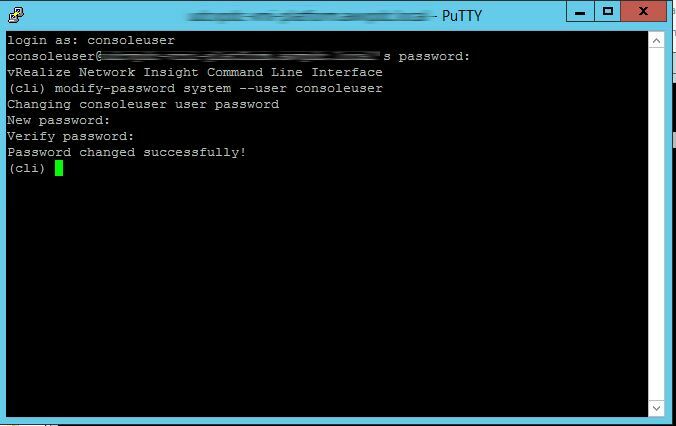 I had difficulties using WinSCP due to the limited console access given by the appliance so I used pscp.exe that comes with the Putty package. The location to where you can copy the bundle to can also be a bit of a challenge. I chose /home/consoleuser/downloads/ using user consoleuser. Below is the command I ran from a PowerShell prompt from my Windows box. 5. Run the package-installer command to upgrade the appliance. Below is an example of the command I ran. The upgrade process can take a while so be patient. A successful upgrade should look similar to below. 6. SSH over to the Proxy appliance now with the same user account consoleuser. 7. Run the same command as on the Platform appliance. 8. (Optional) Run show-version and confirm you are running the latest version build on each appliance. That’s all there is to it. Stopping and Starting services aren’t necessary. As with no need to reboot appliances. You can now open up a web browser and login to your upgraded vRNI platform appliance. Check that everything looks over in settings.